µTorrent (or uTorrent) is a free, closed source, and most widely used BitTorrent client available in Windows, Mac OS, and Linux. The program was designed to use minimal computer resources while offering functionality comparable to larger BitTorrent clients such as Vuze or BitComet. 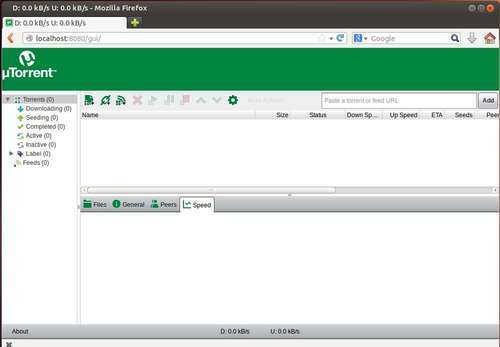 µTorrent for Linux is composed of a µTorrent server and a web based client. Below I will show you how to install it in Ubuntu step by step, tested in a fresh 64-bit Ubuntu 14.10 installation. You may first check out your OS type from shutdown menu (top-right gear button) -> About This Computer. Then select download “µTorrent Server for Ubuntu 13.04 – 32-bit or 64-bit”. 2. Once the downloading process finish, go to the Downloads folder in file browser and extract the package through its context menu. 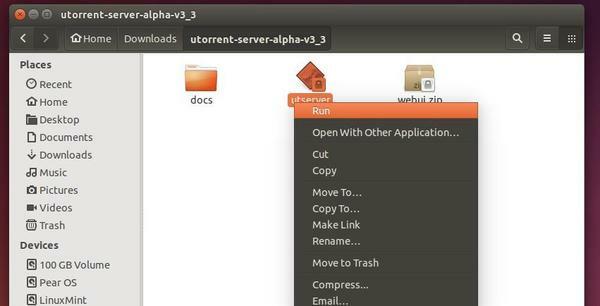 Tip: If you want other users on the Ubuntu system to be able to use the uTorrent server, extract the package to /opt/ directory. To do so, open Archive Manager as root/admin by running sudo file-roller in terminal, then open and extract the package. That’s right you see nothing happens because the server is running as a background program. Go to Properties in its right-click menu, check the box where it says “Allow executing file as program” under Permissions tab. Cheers to you Ji m! I’ve been using ubuntu for one or two years, and thanks to you, I’ve found solutions for a lot of problems. Not to say al the time I saved and knowledge I got! Really really appreciate all your posts! Keep it up! The only tutorial that worked for me..